People on the Move: Davey vp takes on editor role; LandCare hires new branch manager; and more from Massey, BNSE and Fockele Garden Co.
Arboriculture and Urban Forestry, formerly the Journal of Arboriculture, is a bimonthly journal devoted to the dissemination of knowledge in the science and art of planting and caring for trees in the urban environment. LandCare hired Wes Price as branch manager at its East Bay location, in Pleasanton, Calif.
Price has experience in a wide variety of industries, including technology, cement, consulting, window manufacturing and installation and safety supplies and training. Massey Services promoted Preston Koch to east Florida regional manager. Koch will be responsible for all aspects of operations including sales, service, training and community relations in this region, which covers nine service centers in Volusia County, Fla.
Koch joined Massey Services in 2011 as a general manager in training and was promoted to general manager five months later. He served as general manager of the Avalon Park Service Center and following that appointment, was appointed to general manager in the GreenUP Oviedo Service Center. During this time, Koch managed all segments of the residential business, and both service centers saw profitable growth under his leadership. Koch is a graduate of Western Governors University and holds a bachelor’s degree in business and human resource management. The Bill Nelson Scholarship Endowment has awarded four scholarships, each in the amount of $2,500. Forty-seven applications were received. Recipients for the 2018 awards are: Morgan Conville, of Midland, N.C.; Luke Herman of Nixa, Mo. ; Jack Hoog of Lexington, S.C.; and Brett Hopf of Jasper, Ind. Conville is majoring in Spanish and K-12 education at the University of North Carolina-Asheville. Her father is employed by Husqvarna. Herman graduated from Nixa High School this year. He has been accepted into Missouri State University, where he will major in entrepreneurship. His father is employed by Timken. Hoog has graduated from Lexington High School and plans to go to the University of Dayton to major in engineering. His father is employed by Husqvarna. Hopf is an undergraduate at Indiana University where he is majoring in biology with a minor in chemistry. His mother is employed by Stens. 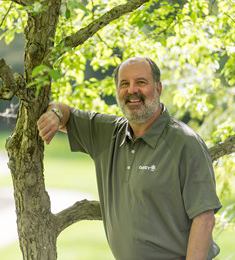 Erik Staiger has joined the Fockele Garden Co. team as a landscape design and salesperson. Staiger brings 10 years of experience in the industry as well as a bachelor’s in landscape architecture from the University of Georgia. He specializes in design, sales and project management. He is also an accomplished plantsman.